It is no surprise that I love Smallville and I miss it terribly on our TV screens. 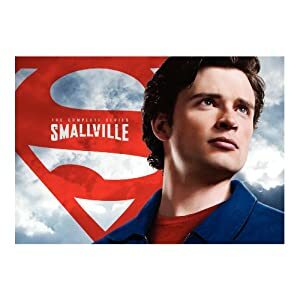 There are rumors that there will be a season 11 in novel form written by Smallville writer Bryan Q. Miller – I hope that is true as at least I would consider it canon versus the fan fiction I have been reading. But to get my Smallville fix, I recently bought Smallville the Complete Series that has 62 discs that contains the 218 episodes and some special docs that includes a 100 minute behind-scenes doc on the series over its 10 year run. There is also things like a 1961 Superboy pilot and the pilot to Aquaman that starred Justin Hartley before he became Green Arrow. Now I have admitted that I never really watched Smallville throughout its entire 10 year run. The only season that I saw every episode was season 10 and that is for one reason only and that is the romantic pairing of Clark Kent (Tom Welling) and Lois Lane (Erica Durance). I’ve waited for that show to bring them together but had to wait a long time. But I realize why they didn’t put them together until really season 8. Simply put Lois and Clark don’t get together until they are both at The Daily Planet and that didn’t happen until season 8 and that is why everyone suffered 8 years of Clark and Lana (Kristin Kreuk). When I decided to get the complete series I just wanted to see every episode that Lois was in and season 9 but if I truly want to see the evolution of Clark Kent then I need to see all the episodes no matter how much I hate Lana Lang. What I plan on doing with this blog in terms of Smallville is do Redux reviews of key episodes or episodes that I want to blog about. So expect a blog about the Pilot, the episode that Amy Adams (Lois Lane in The Man of Steel), the episodes that feature Christopher Reeve, Dean Cain, Teri Hatcher, and Margot Kidder. I will also blog about Lois Lane’s first appearance on Smallville and any other significant ones like the show’s 100th and 200th episode. I have already reviewed Prophecy and the Finale. And since I miss Smallville so much and haven’t seen most of these episodes, it would be like having it back on my TV again. I’ve got 218 episodes to sift through so it is going to be a while before I finish so hopefully you enjoy the ride as much as I do.